His connection with the audience was so strong that, at one point, the chamber broke into a rendition of “Happy Birthday” for Judah Samet, an audience member who survived the attack on the Tree of Life Synagogue in Pittsburgh last October, which killed 11 members of his community. Samet, who turned 81 on Tuesday, also survived the Holocaust, spending 10 months in a concentration camp before being freed by American soldiers. 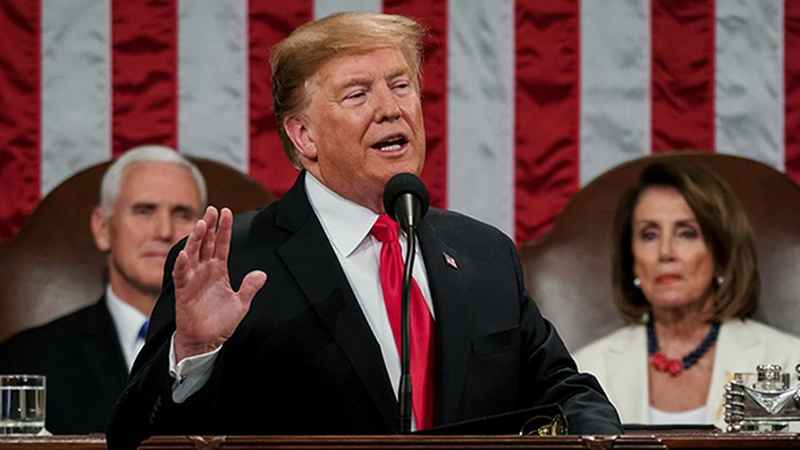 Trump enumerated some of the successes his administration has achieved since he took office: 5.3 million new jobs (600,000 in manufacturing); 5 million Americans off of food stamps; a rapidly growing economy; the lowest overall unemployment rate in half a century; the lowest unemployment rates ever for African-Americans, Hispanic-Americans, Asian-Americans and Americans with disabilities; the passage of tax cuts; the end to Obamacare’s individual mandate penalty; the passage of the Right to Try Act, which gives eligible patients access to eligible investigational drugs; the massive reduction in governmental regulations; the emergence of the United States as the world’s No. 1 producer of oil and natural gas and a net exporter of energy.